Christchurch, South Island, NZ. 30th January 2015. If you look at the Banks Peninsular on a map it gives the impression of a flower, with petals surrounding the stamen. It is very obvious from this that the area was created by a series of volcanic eruptions millions of years ago. In the centre is the caldera, once a lake but now linked to the sea by a narrow passage. The central ‘lake’ is surrounded by steep hills which in turn run down in to small bays. The countryside is wild and windswept and, as I rode out to it, very cloudy too. 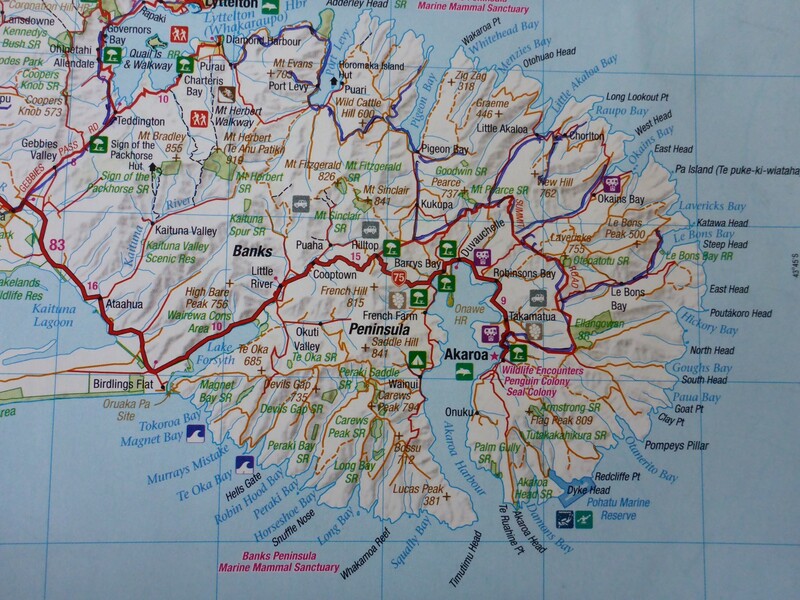 My plan was to explore the many gravel trails, free camp for a couple of nights, and then head south down the coast. Volcanic heritage at the Banks Peninsular. 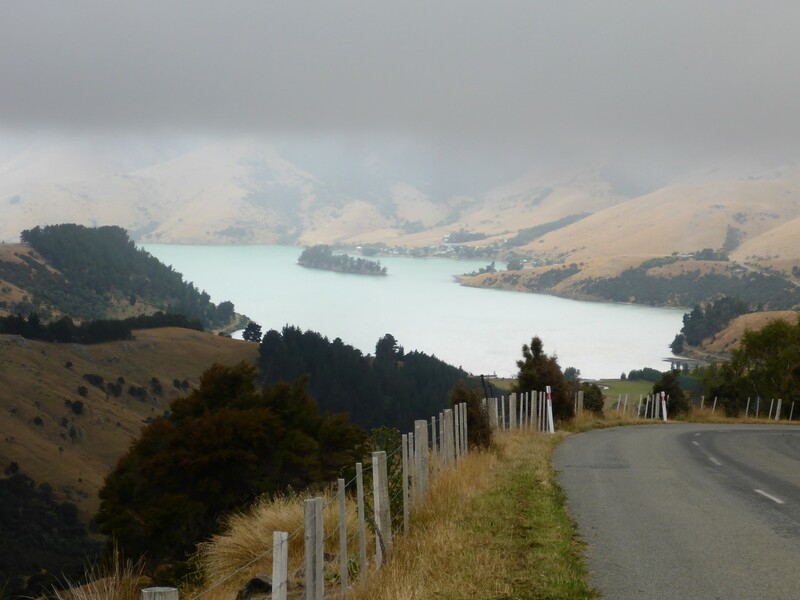 I left Christchurch towards Lyttleton and then headed to the hills. I stopped at a view point and got chatting to a couple of nice English women, who had hired bikes for the day. Nora and Bernadette where on a six week holiday and were quite jealous of my four month long NZ tour. I headed out around the bays, diverted inland to get some fuel as I’d forgotten to fill up when I left the city, and just enjoyed wandering about. Most of the gravel trails just led to the sea, although a few did link up with other roads. The weather was a bit chilly and showery but I was happy just tootling around, no deadline, no pressure. Eventually I Came to Pigeon Bay where I found a campsite. I pitched my tent and took a look around. It was a strange place which had about twenty caravans on it (the towing type), most have which clearly hadn’t moved in years. Some didn’t even have wheels on them. There was no-one around and I found an honesty box where I could leave my $10 fee – except that I had no change. I’m guessing the site was used by weekenders and fishermen, being right next to the sea. Further down the road was a boat launching ramp. These seem to be publicly supplied as there’s a launching place in almost every waterside town or village. 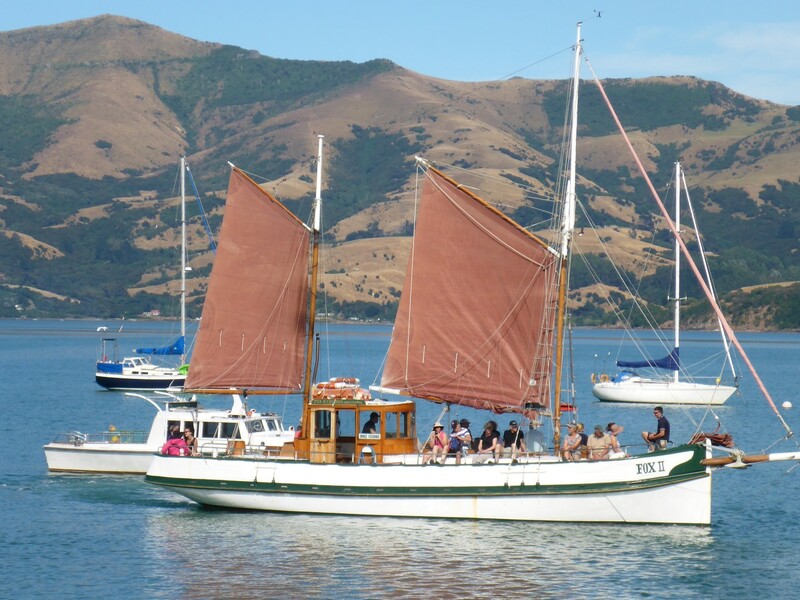 I’d already realised how much Kiwi’s love their boats and their fishing. Eventually the caretaker came round and I was able to pay my fee. He also gave me some good advice on routes around the peninsular. The site was another terrific place for birdsong too, a real treat. Pigeon Bay, good for boaters and fishers. 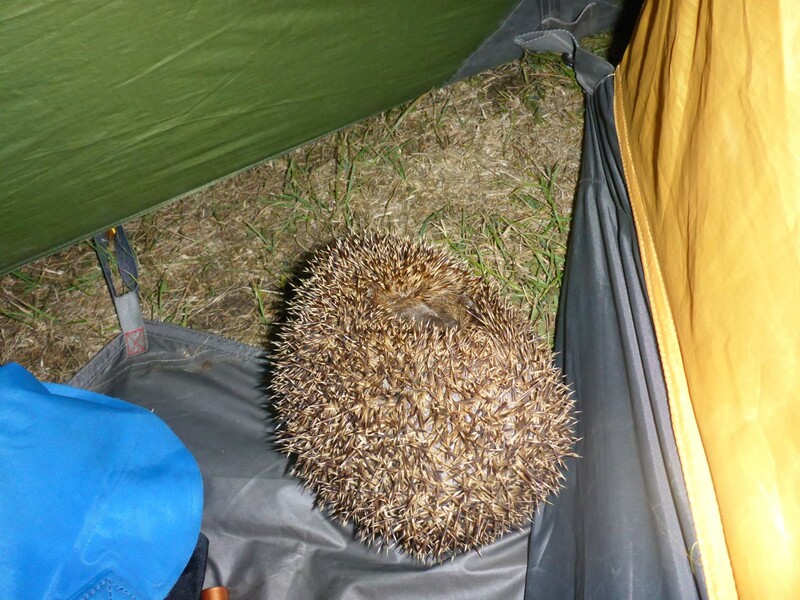 In the early hours of the morning I was woken up by what I thought was someone walking past my tent on the gravel. Then I remembered there was no gravel and realised that something was rooting through the rubbish bag I’d left in the tent porch. I unzipped the inner door, put my hand round it and came up against a hedgehog. I let go of it very quickly indeed! It was all curled up so I pushed it out under the tent flap and moved the rubbish bag over to the other side of the porch. In the morning an apple core had gone so Henry Hedgehog obviously came back for a second go. It was a showery morning so I decided to stick around. 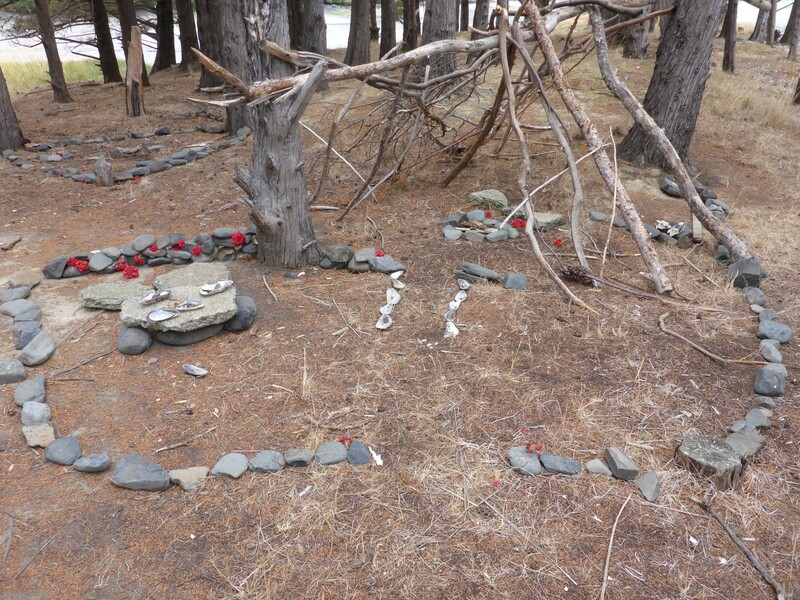 While walking through the nearby trees I found a collection of tree branches, shells and stones laid out as what looked to be a shrine. It seemed to me like a representation of a house, with a kitchen/living area and another room next to it. Very odd. More people had arrived by now and when I asked one of them about it he reckoned it was just kids messing about. He did say that the area used to be a Maori fishing village though, so maybe there’s a connection. Created with a purpose, I just don’t know what it is. The rain cleared up in the afternoon so I went for a nice long walk down the headland. The sea looked great. Grey, and with clouds scudding around the surrounding hills. I walked for about three hours, survived a shower of rain, and really enjoyed my evening meal. Henry paid another visit and this time my camera and I were ready for him. 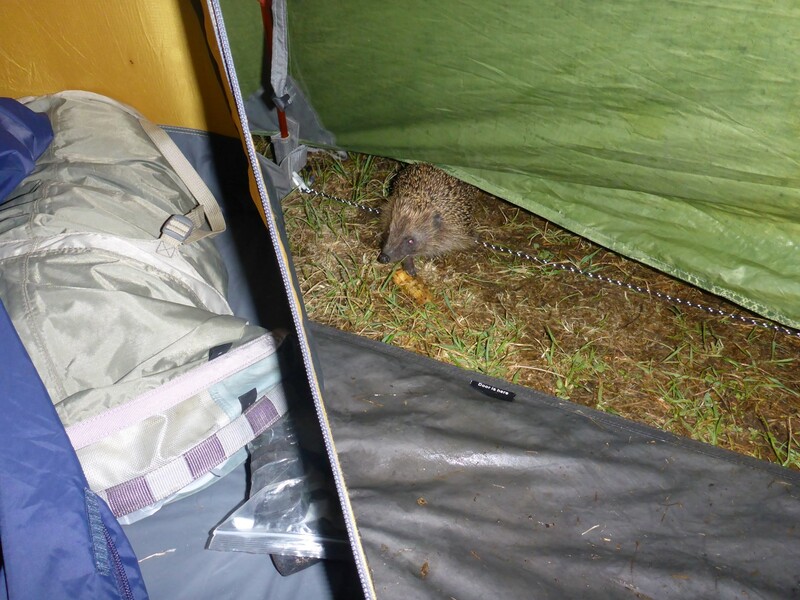 Henry Hedgehog gets his reward. More trails to explore next day, with names such as Starvation Gully and Summit Road. The ground was a mixture of stones, grass, ruts and mud. A bit more challenging than gravel and they reminded me of Green Laning back England. 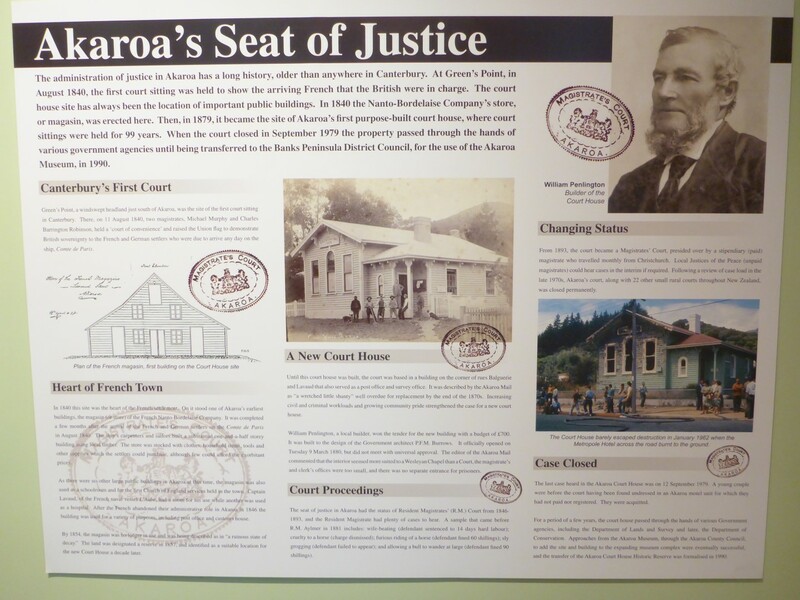 I headed for the town of Akaroa, a very pretty place on the edge of the sea lake. There are two hostels there but there was no bed. The best I could do was a camping space in the garden. No excuse not to use the shower though! 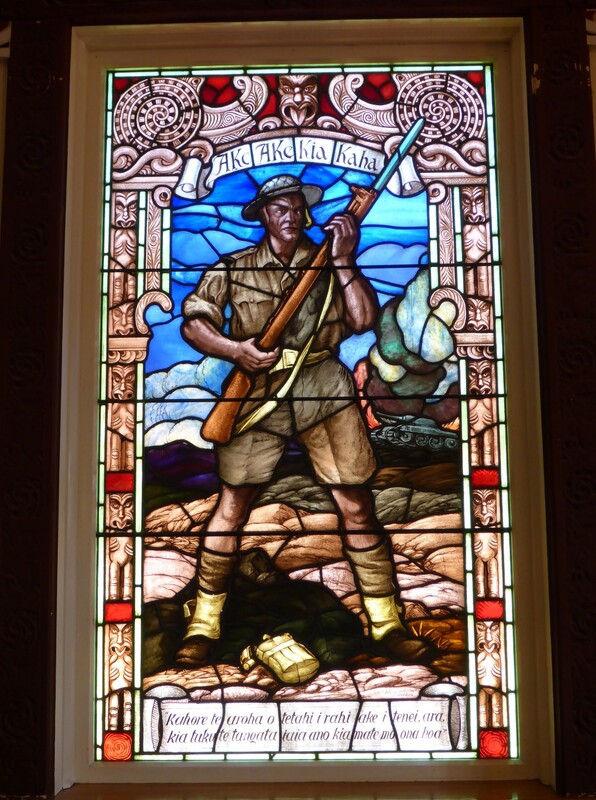 I mentioned previously how some French settlers were heading for NZ. Akaroa was their destination although it by the time they arrived the English authorities had established a settlement, in the nick of time. Even so, they were still welcomed and settled there so the town has a very French flavour to it. 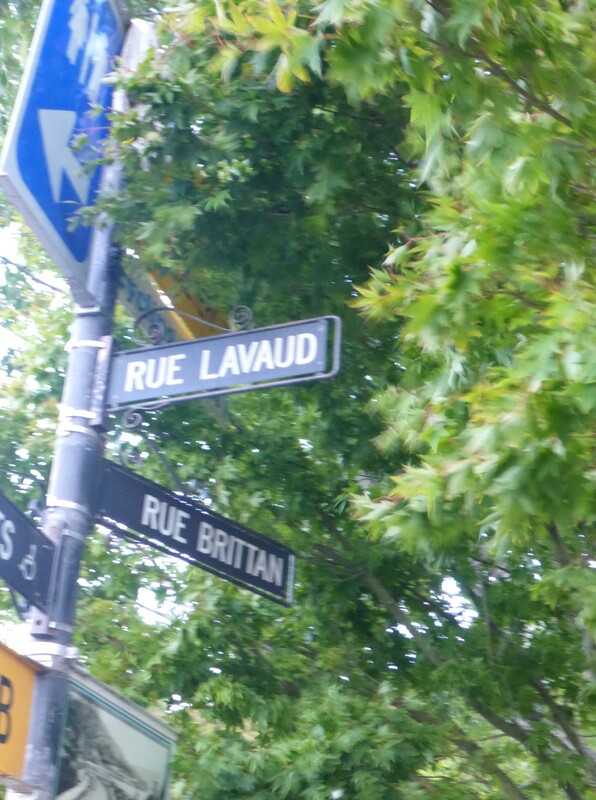 The majority of the streets have French names and many of the businesses do too. 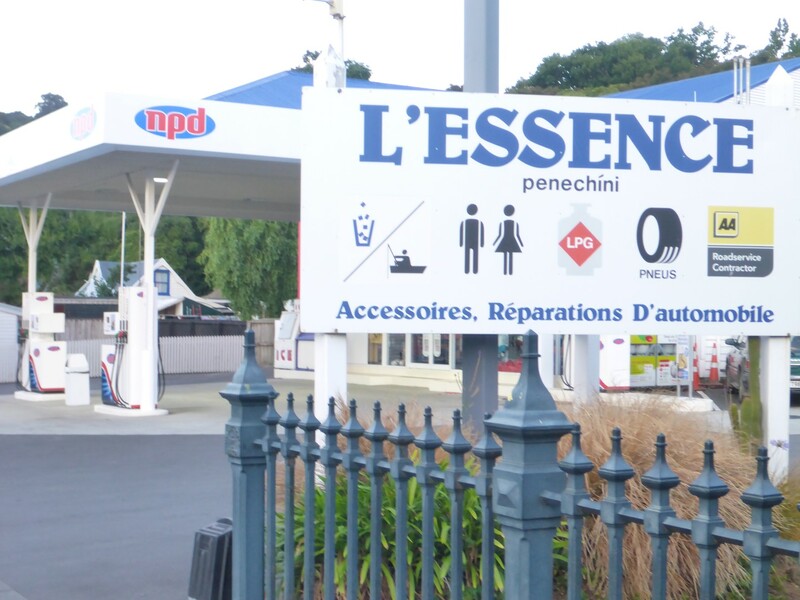 Things came very close to the south island being French. Mon Dieu! I wonder if the petrol came all the way from France too? 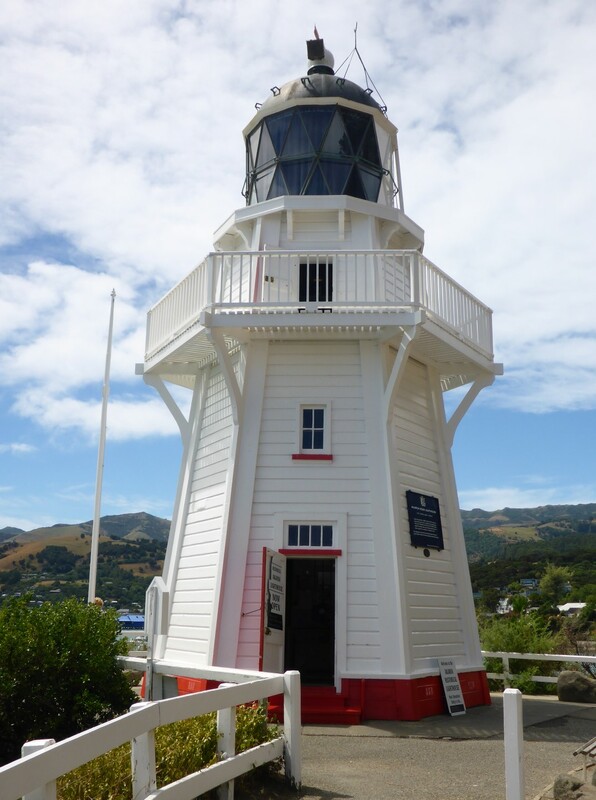 Walking round the town in the very warm sunshine was a real pleasure, as was the visit to one of NZ’s last wooden lighthouses, now preserved on the seashore. Built in 1880, it was only replaced as recently as 1980, when an automatic one was installed, and it was dismantled and moved to its present site. Several boats worked out of the harbour, offering tourist trips to view seals and penguins. I met a Dutch guy at the hostel, Noel. He has ridden his Honda Africa Twin all over Europe, Iran, Turkey, Russia and Mongolia, although he was backpacking this time. He knew Lukas, the Austrian guy I’d met on the ferry to Japan, and also Michael, the Danish guy I’d met in Kyrgyzstan. More evidence of how small the world sometimes seems to be. A venerable veteran of lighthouses. 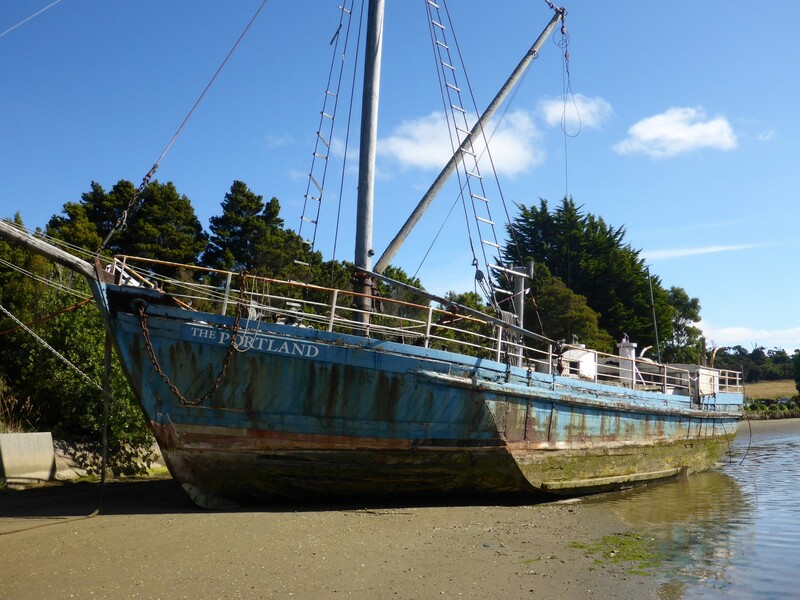 A venerable veteran of the water, now used for wild life trips. The next destination was Lake Tekapo, near to Mount Cook. It was time to head inland for a while. On the way there I stopped at Fairlie, a place that Grant, who I met on the ferry, suggested I should visit. It’s famous for its pies and having ate two of them, I can see why. Ingredients such as venison with cranberry, that was so delicious I tried the pork and apple, which came with a little bit of crackling on the top. Fantastic. At Lake Tekapo I called in to the i-Site to find a hostel bed. Outside, who should I bump into but Noel, from Akaroa. The hostel he was at was full. Down at the Lakefront Lodge I was in reception and who should I bump into but Bernadette, one of the two women I met near Lyttleton. She was with her husband this time. Time for a bit of a moan here. This hostel wasn’t one of the cheapest I’d been in, at $30 and they wanted $7 a day for wi-fi access. To me that is a rip off and it’s one of the things that has annoyed me about NZ. The only other place I’d been forced to pay for wi-fi was Germany. To my way of thinking it should be included. Even worse though was that as the evening wore on the wi-fi got slower and slower until it packed up altogether. A proper rip off. OK, rant over. When I rode out towards Mount Cook next day the sun was shining although the wind was very strong. My poor bike was really struggling and the fuel consumption was really suffering. 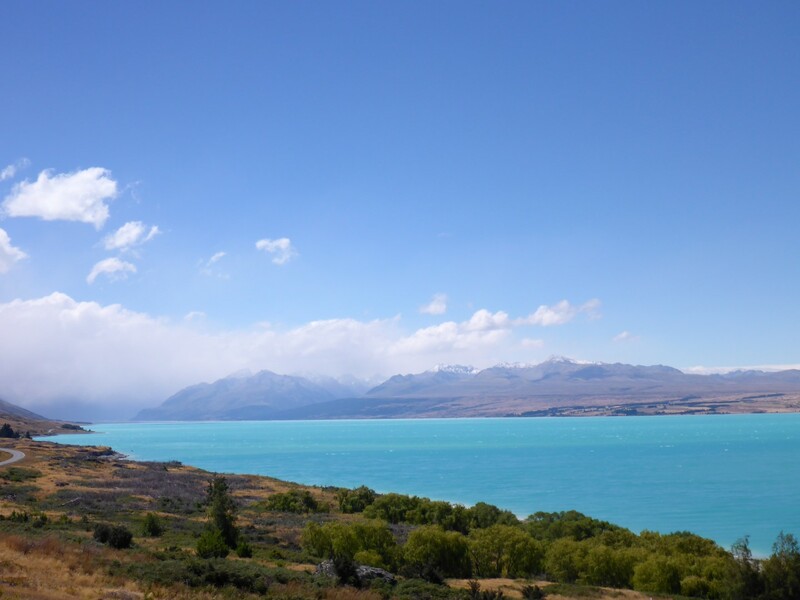 Lake Tekapo and Lake Pukaki looked fantastic, deep turquoise in colour and pretty as anything. Unfortunately as I approached Mount Cook the weather closed in and the sun went. The mountains were mostly obscured by clouds so I didn’t get the view and the photos I wanted. 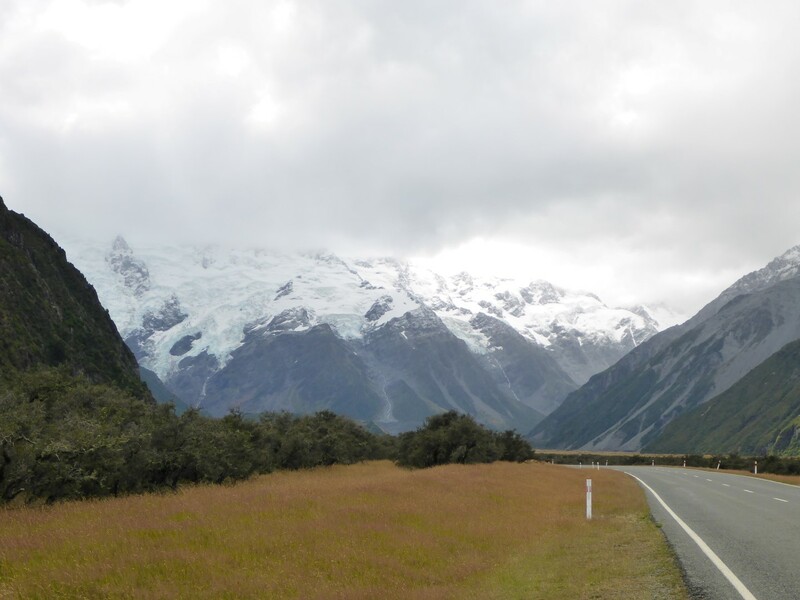 I took the road that led to Tasman Glacier viewpoint and in the car park I met Noel again. We chatted a bit before I began the rather steep walk up to the viewpoint. Halfway up I met Bernadette and her husband once more. We chatted and I was very glad of an excuse to stop for a rest as the climb was proving to be hard work in all my heavy bike gear. At the top I could just about see the edge of the glacier way in the distance. It has receded significantly over the last twenty years and the lake it feeds into is low too. Global warming at work, sadly. The disappearing glacier. The bank visible on the right was the level of the glacier twenty years ago. 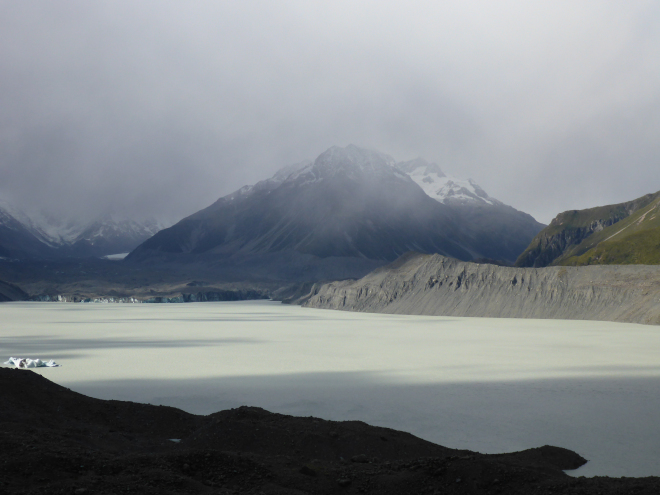 Too cloudy for Mount Cook to show up, but still a magnificent vista. My next destination was the city of Dunedin, back on the east coast. 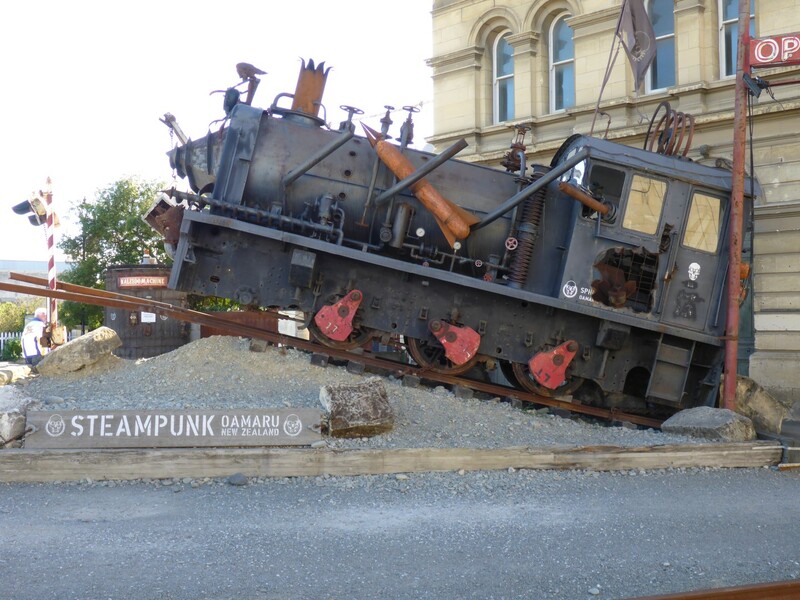 I’d booked a hostel in Oamaru to break the journey. About 12kms outside of Lake Tekapo, my speedo cable broke. Not to worry, I had a spare. So I dug it out and fitted it but it was too short. I’d only bought the inner cable so I was now going to have to buy a complete unit because I didn’t know whether the problem was that a non standard one had been fitted at some time or the spare I’d bought was wrong. Probably the latter given that it came off Ebay. Oh well, something else to add to the list of bits to buy. Fortunately my GPS records distance travelled even when I’m not using it to follow a route. All I had to do was keep it switched on. Another travelling biker, Peter from Denmark. Further down the road I stopped to look at some Maori cave paintings. Very disappointing as they were just some bad charcoal sketches of a sailing ship and a man on a horse, so clearly not even very old. But I did meet another biker in the car park, Peter from Denmark. He was on a six week holiday and, like Geoff the American, had hired a bike. He rides a BMW K100 at home, a great bike, one of which I used to own many years ago. Further along I turned off down a side road to seek a gravel trail. 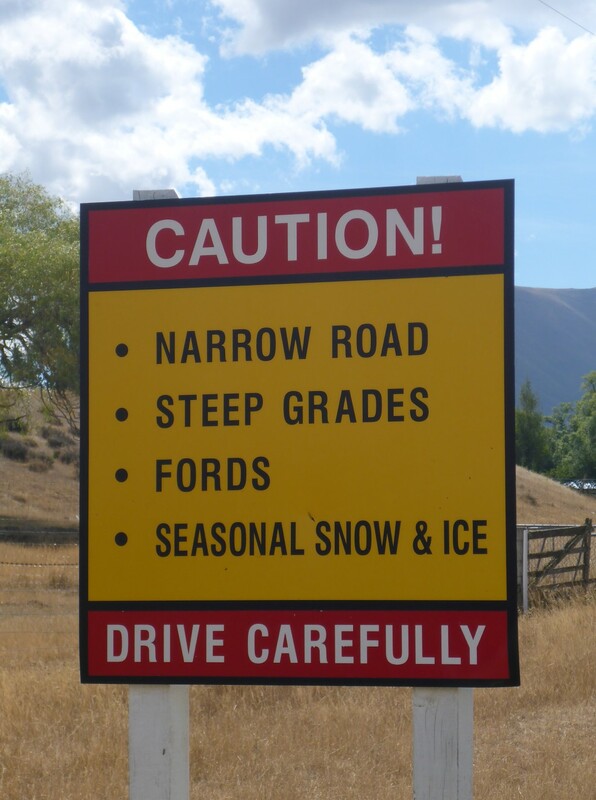 When I found it there was a sign warning me about sharp bends, steep hills and deep fords. A ‘welcome sign’ as far as I was concerned. It wasn’t actually all that challenging although it would have been a different matter in winter. The kind of sign I welcome. 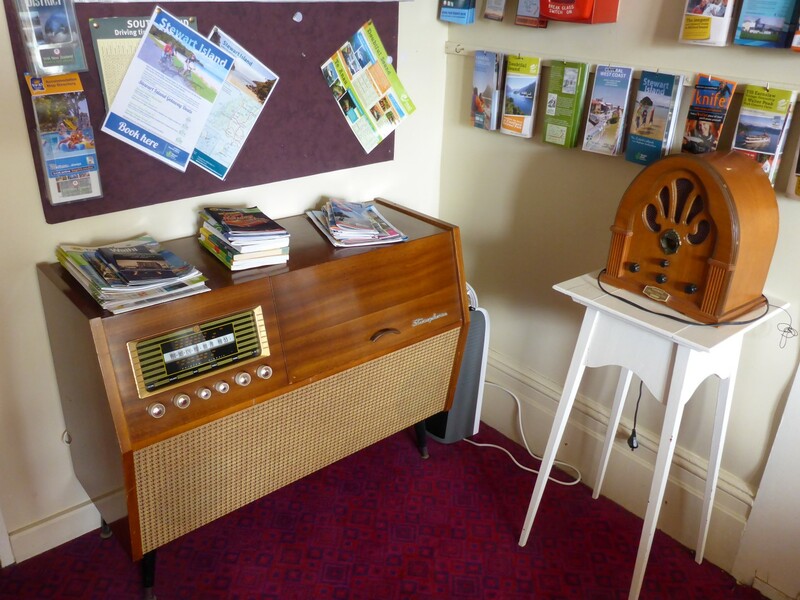 In Oamaru I found the hostel and settled in to wait as reception didn’t open until 4pm. I made some tea and managed to get on the internet. While I was busy I suddenly heard a voice say ‘Who wants chicken?’ I looked up and saw a woman standing by the door so I asked whether it was cooked, raw, whole or in pieces. She glared at me and then said, very deliberately ‘Who wants to chick-in?’ And then I realised she meant ‘check-in’ but Kiwis pronounce their ‘e’ like an ‘i’. So, egg on face, I went to ‘chick-in’ and apologised to her for the misunderstanding. But I couldn’t stop myself smiling when I saw a notice on the kitchen wall saying there were hen’s eggs for sale at 30 cents each. I just had to wonder which came first, the chick-in or the eggs. The hostel had a bit of an old fashioned flavour to it, as witnessed by some of the furniture. 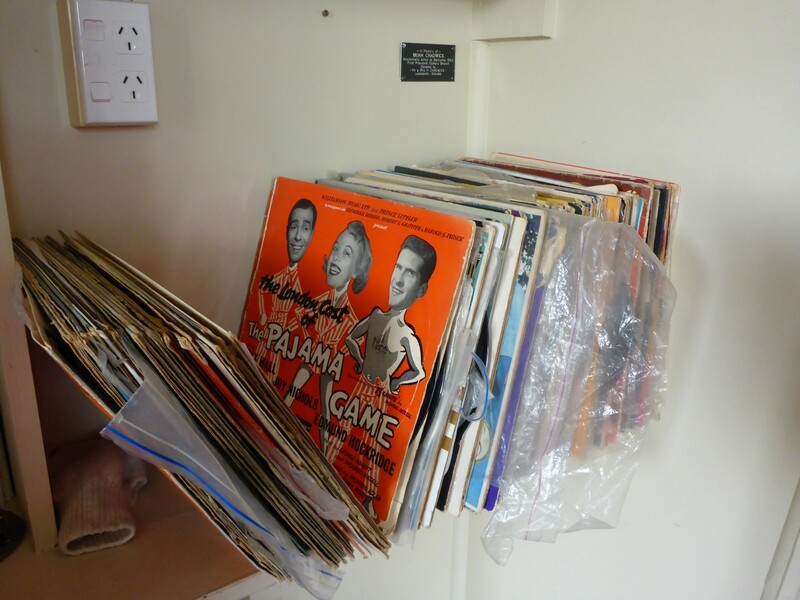 But I did enjoy looking through the records. While in this town I had hoped to see the rare Blue Eyed Penguins which live on the beach here. They come back from their fish hunting trips at dusk but when I got to the viewing point there were none to be seen. In fairness I was a bit early but as it was cold and raining I gave up and went back. 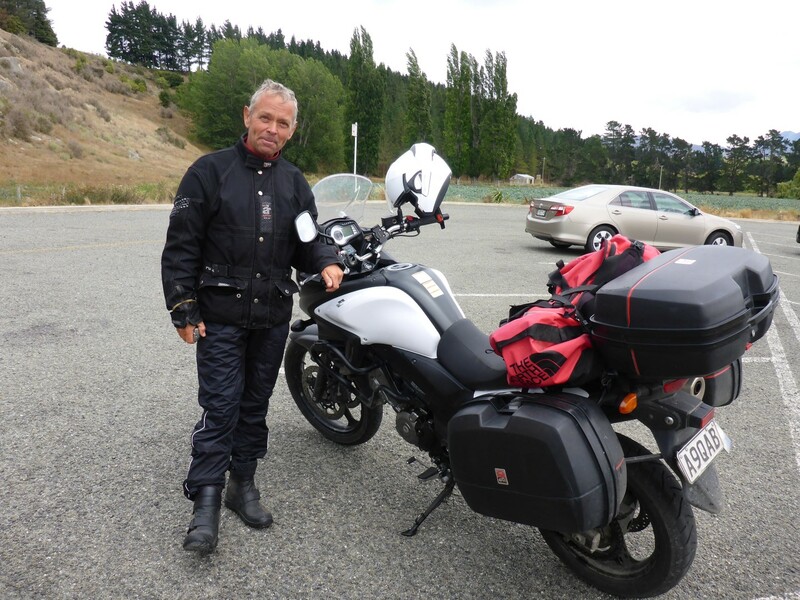 I stopped to chat to an Aussie guy who had been thinking of bringing his Ural outfit over to NZ but it was going to cost him over £1,000 each way so he and his wife hired a small camper instead. I’d often heard that the Tasman Sea was one of the most expensive stretches of water in the world to cross so now I was worried about what I might have to pay when I went in the opposite direction. Outside the Steam Punk Museum. 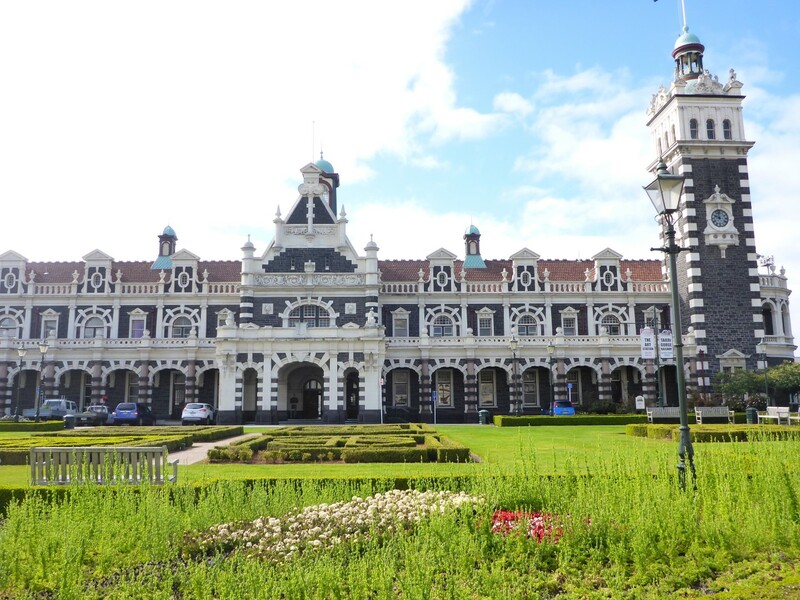 Next morning I left for Dunedin but stopped in Oamaru town centre to look around. There were some very nice, stone built municipal buildings along the High Street, mostly erected between 1850-70. 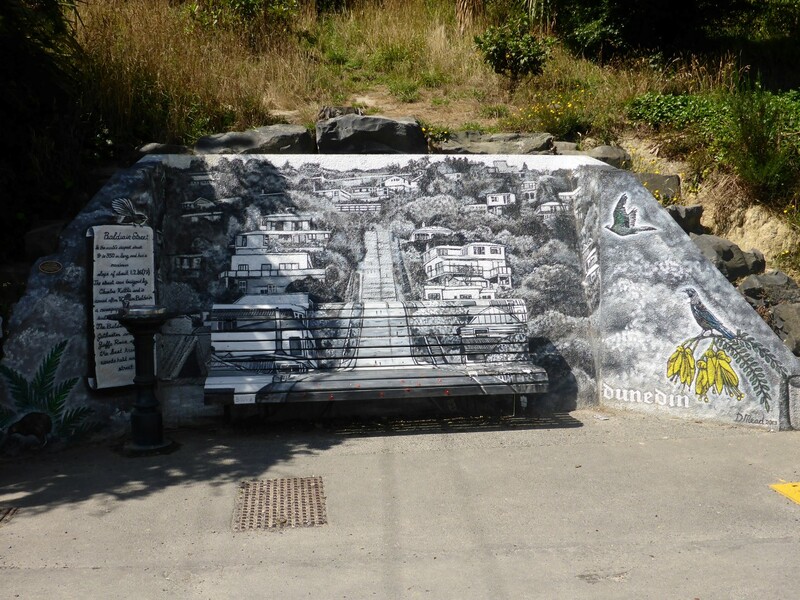 Apparently the cost almost bankrupted the town but they managed to survive and are great examples of their type. When I got back to the bike who should I see but Noel. Just how small is this world going to become? He’d seen my bike while driving past and had stopped for a chat. 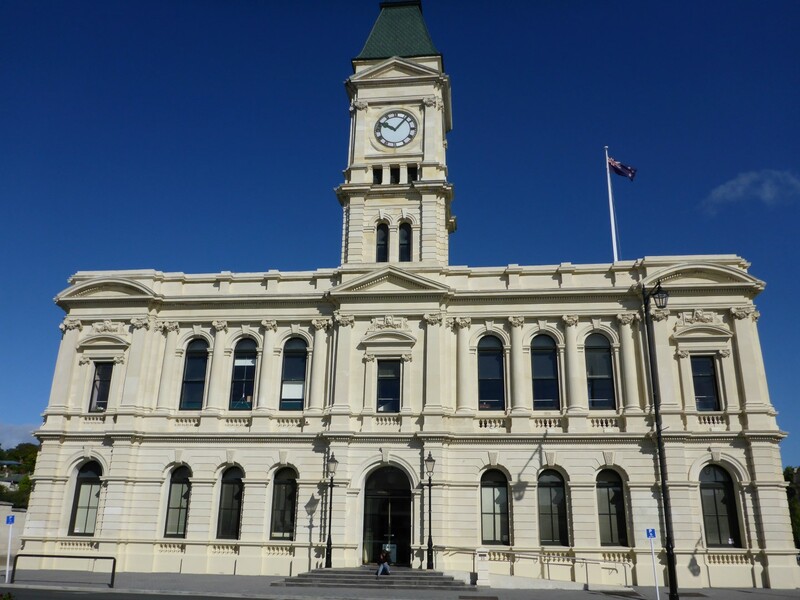 Oamaru town hall. Monument to excessive municipal ambition. Eventually I set off and finally made it to Dunedin, where I was going to be staying with Maureen for a few days. She is the Kiwi that I’d met briefly in the hostel in Lithuania. She’d invited me to stay and who am I to turn down a free bed? In truth I was looking forward to seeing her again as we’d kept in touch after we’d met. It was a very windy, and wet, ride through the hills as I approached the city and Doris seemed to be really struggling. At first I thought there was something wrong but eventually realised it was just the combination of weather, terrain and a small engine. Once I’d arrived Maureen made me very welcome. We chatted and reminisced and found out more about each other. Maureen has three kids and seven grandkids but split up from her husband many years ago. There was another guest due to arrive later, via the Couchsurfer website. She was going to stay for a few days too. 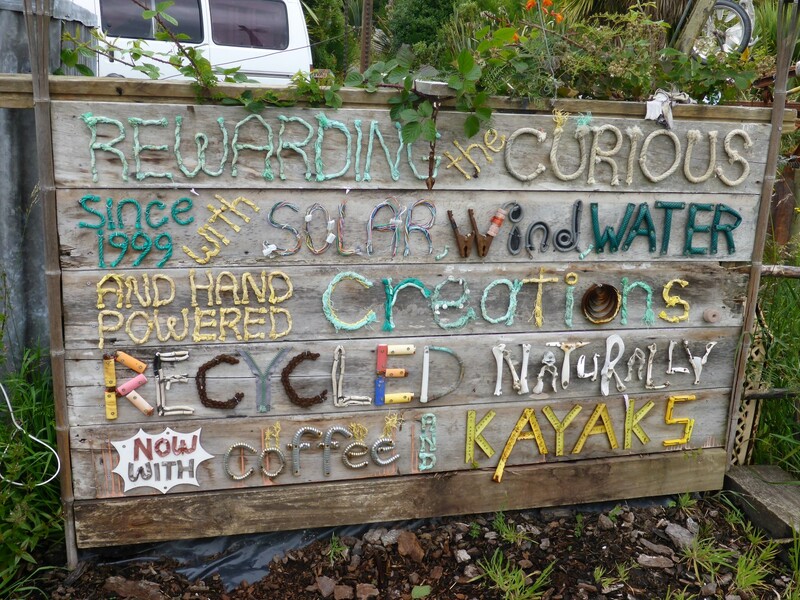 Couchsurfing seems to be a way of getting free accommodation at the homes of willing participants. Maureen tends to provide the first evening meal and then the supplies for breakfast thereafter. Generally it operates on the principle of taking when you need to then giving when you can. Money does not usually change hands although the guest will often buy or cook a meal or share a skill. It seems a great idea although it might not suit me so much as it involves more forward planning than I usually commit to. Maureen went to collect Karen from the bus station. She’s a 67 year old American, a former computer programmer, now retired. She spends all her time travelling as she has no other commitments. I wonder who that reminds me of! She seemed to be a bit abrupt at first but as she relaxed we realised that she just happened to be quite a matter of fact person. 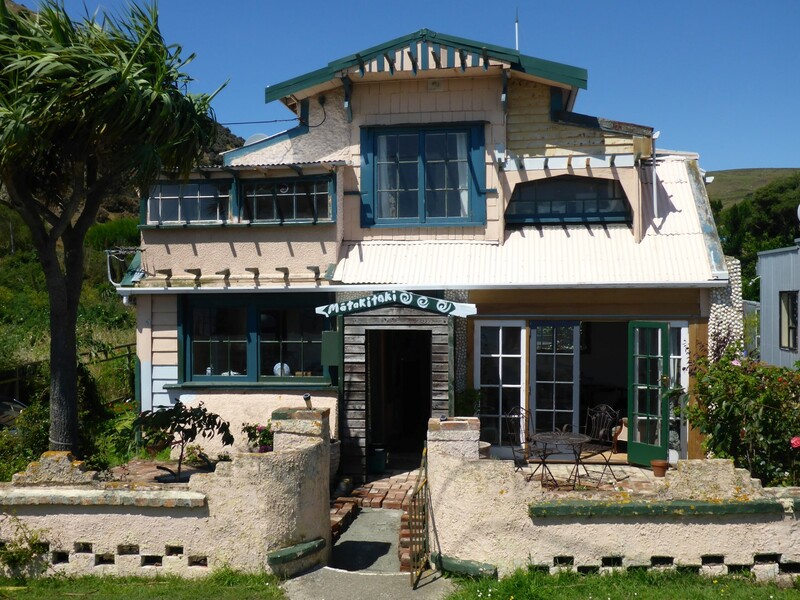 We all had a good weekend together and Maureen drove us around the city and out onto the Otago Peninsular, which is an attractive spit of land with great sea views from the high cliff road. There are a couple of penguin sanctuaries out there, as well as one for albatross. A plan for the week was formulating in my mind. 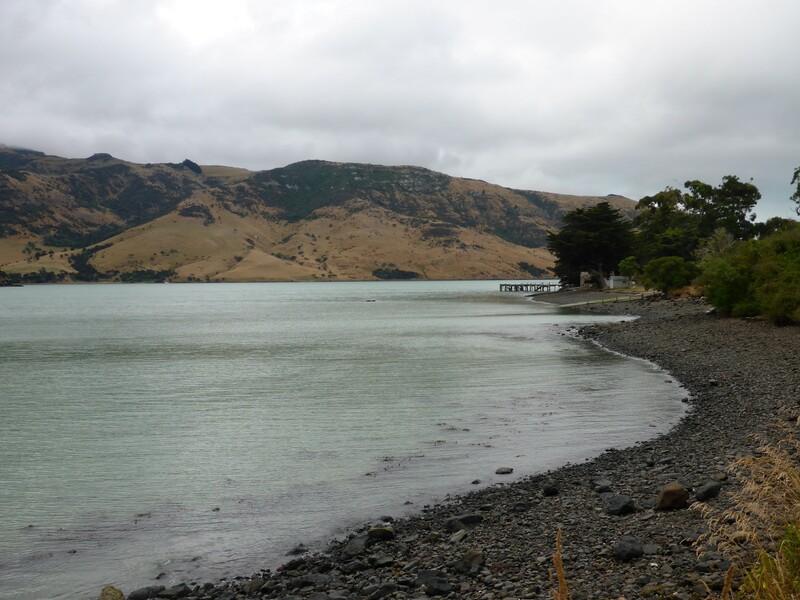 We drove through a small village called Wellers Rock, one of the first whaling stations in NZ. I spotted an interesting house there and asked Maureen to stop. Altered and unevenly extended, the former supplies store at Weller’s Rock. The owner was outside and I asked him if it was OK to take some photos. We got chatting and this house used to be his holiday cottage but is now his main residence. Why? Because of the Christchurch earthquake. He had a large property there, worth $850,000. It suffered some damage which would cost about $125,000 to repair. But the area was red zoned so it was pulled down along with all the others in the zone. All he got from the insurance company was the $125,000 to cover the damage, nothing else. He then spent $65,000 fighting a legal battle to get the full value of the property but he lost. As I mentioned before, this was a common story and to me, quite shocking. Maureen told me this guy had been a very successful children’s TV entertainer so I guess he was able to carry the loss but most people wouldn’t have been in that fortunate situation. 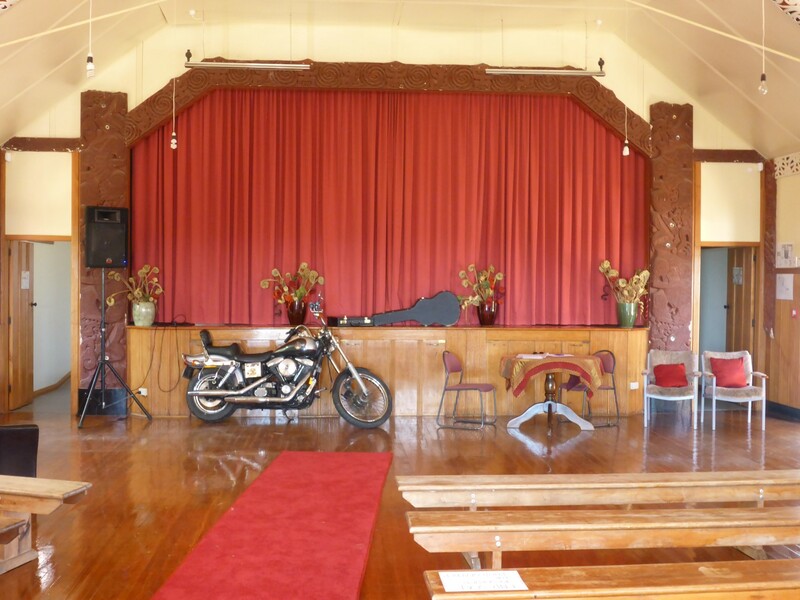 Further along we came to a Maori church and meeting hall. We stopped for a look at the buildings. There was a nice stained glass window in the church but more impressive was the Harley Davidson parked in front of the stage in the hall next door. It seemed that a wedding was about to take place and the bride’s father had died recently. His bike was attending the wedding instead. It made sense to me! Evocative stained glass window inside the church. Guest of honour. Quite rightly. On Saturday evening some of Maureen’s friends came round for a meal. Sue, who I’d met with Maureen in Lithuania, Rhona and Ana. All of them had been travelling companions at one time. Ana was with Jim, her new fella who she’d met on a dating website. He’s a really nice guy and is a biker too, although he tends to go for large and comfortable bikes. We all had a great evening. Kiwis really are an open, friendly bunch and good company is never far away. 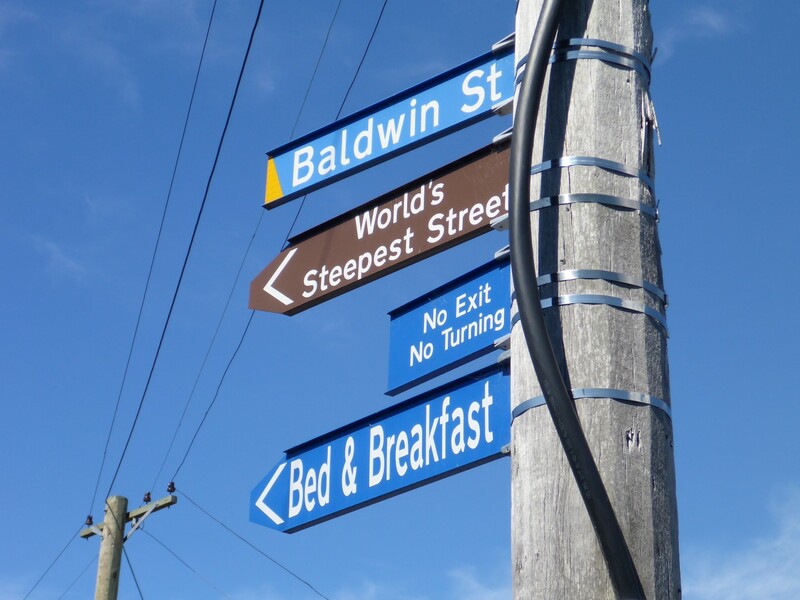 Next day Maureen took us into town and we visited the World’s Steepest Street, called Baldwyn Street. And it really lives up to its name. 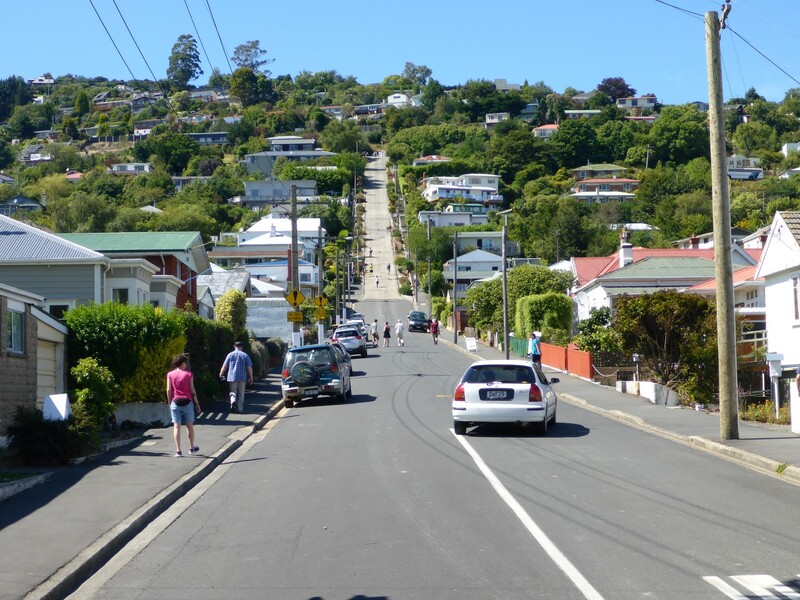 The average gradient is 1:3.4 but the steepest part is 1:2.86. That, my friends, is a hill and a half! Karen and I accepted the challenge and walked up it. I had to stop for a rest once and I was very pleased to find a drinking fountain up at the top, and a bench to sit on too. Why it was made so steep I don’t know. It has houses on it and other streets off it, so in that respect it’s just another urban road. A much needed resting place at the top. 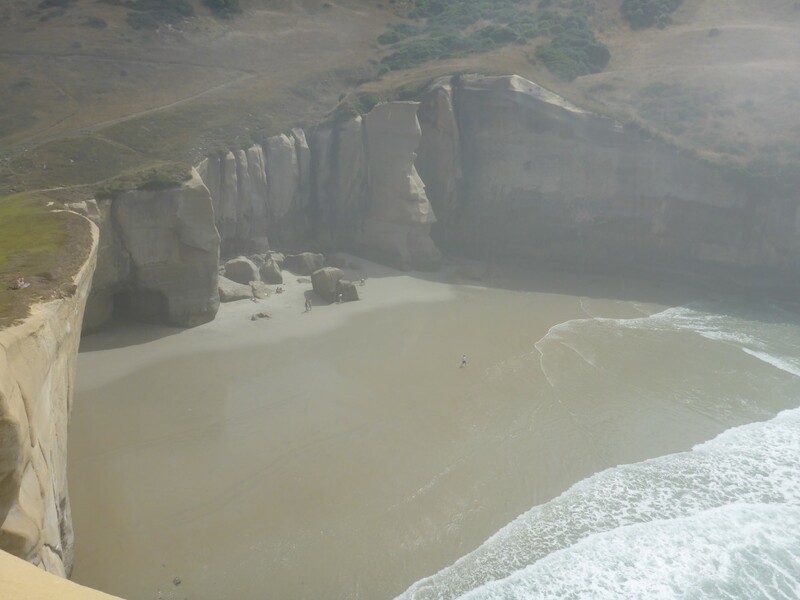 Next we went back onto the peninsular to walk down to Tunnel Beach. This involved another steep hill, much longer this time. At the bottom of the path is a very nice area of limestone rock, eroded into all sorts of wonderful shapes, with caves worn into it. 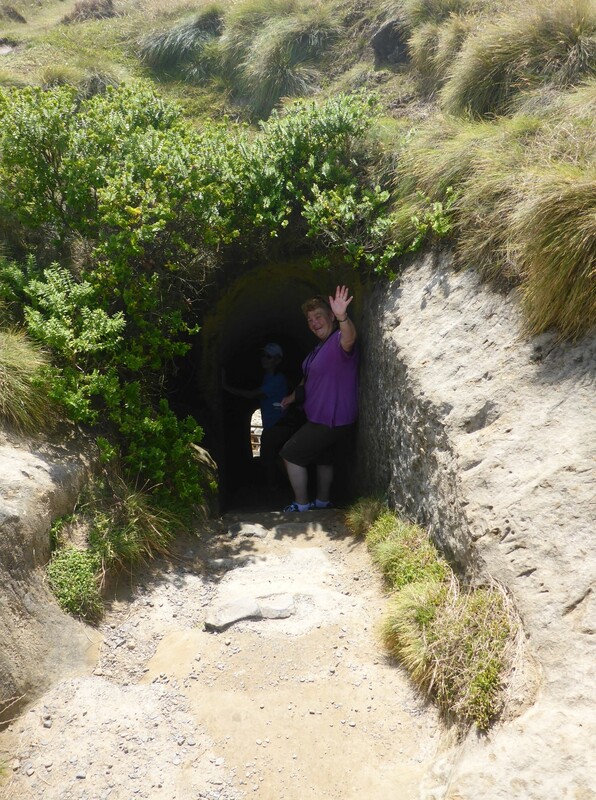 Tunnel Beach is accessed by a tunnel. Who’d have thought it. It’s about 100 metres long, slopes downwards and was dug out by hand. It was done by the landowner who had spotted this really nice beach and wanted to be able to access it. Money talks and he got what he wanted. Someone should have said to him, ‘Be careful what you wish for.’ Soon afterwards his daughter was swept out to sea by a rip tide and drowned. But it is a nice beach despite the sad story. Tunnel beach is very pretty. Limestone formations near the beach. Once we’d recovered from the walk back up to the car we headed home. Karen was due to leave next day and Maureen and I had reached the conclusion that she’s a bit of a weird one. She reckons there is a ‘family’ of world leaders who control everything and that they’re all related to each other. George Bush is related to our Queen, she said. What??? She’s spent the last twenty years living in Boulder, Colorado. Maybe that rarefied air has got to her brain. But she used to live in California before that, so maybe that’s the reason. Anyway, we all had good fun together and everyone is entitled to their theories, however weird. A former neighbour of Maureen’s came round to visit as he wanted to meet me. 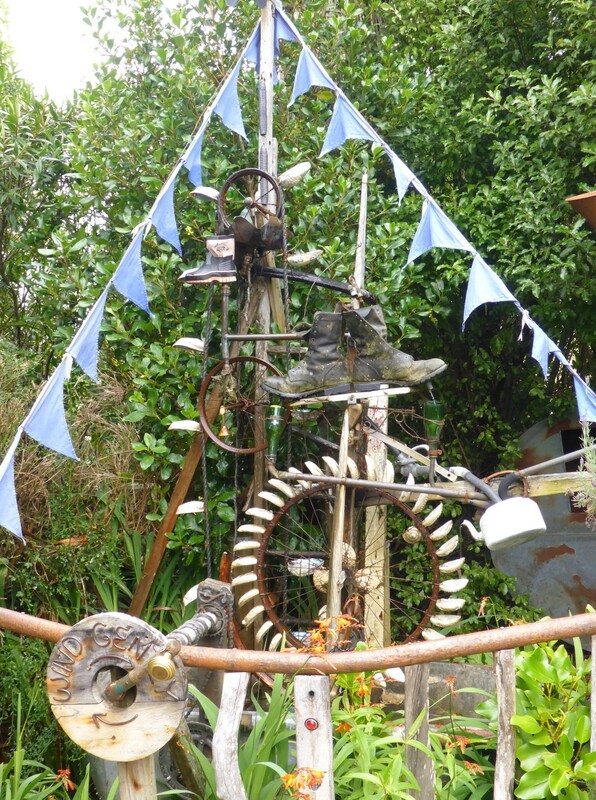 Keith used to live in Bellingham, near Lewisham, but had been in NZ for over forty years. He rides bikes too and used to go to some of the Rocker cafés out at Biggin Hill, so we had a good chat over dinner. He’s been back a few times but like most long term émigrés, he sees ‘home’ as pretty much a foreign place. Being a similar age, I found that we had socialised in some of the same places. Maureen has some friends who live further down the coast. Brian and Jill were due to go on holiday but wanted to meet me before they went. Brian is a keen biker and wanted to hear about my journey. So the plan was to ride down, stay with them, then ride back next day. 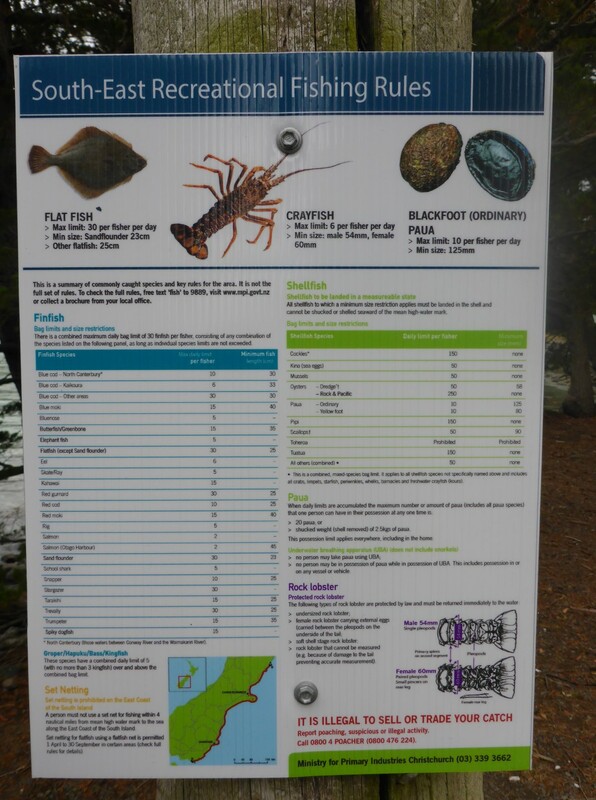 They live in Owaka, down in the Catlins. This is one of NZ’s many national parks and has a more gentle, ‘rolling hills’ kind of aspect to it, as well as a very nice coast line. 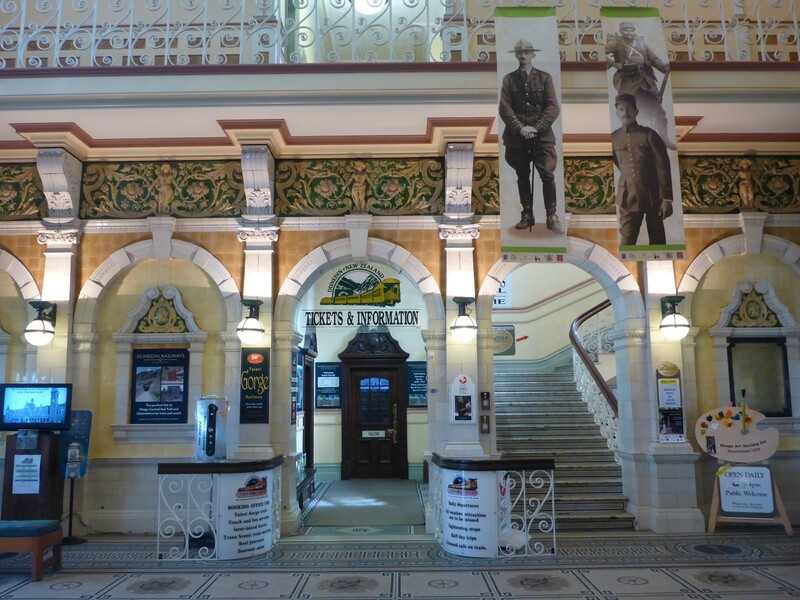 Dunedin Station. A classic design and very well preserved. Before heading down there I went to the Suzuki dealer in town and picked up most of the items I had ordered. They included my much needed speedo cable. I fitted it in the street outside and got chatting to some guys who were meeting up to go for a ride. One of them very kindly gave me a 100mm square metal plate, with a bit of string attached. It’s for putting under the sidestand on soft ground. He said he makes them at home then gives them away to bikers he meets. Thanks Charlie, it’s been very useful. Because I had my GPS to record distance travelled I was able to work out that I’d covered 305kms since the cable broke. So just adding 300kms to each odometer reading made the adjustments accurate enough. When I got to Brian and Jill’s I had some lunch then Brian took me out to show me some of the local sights. 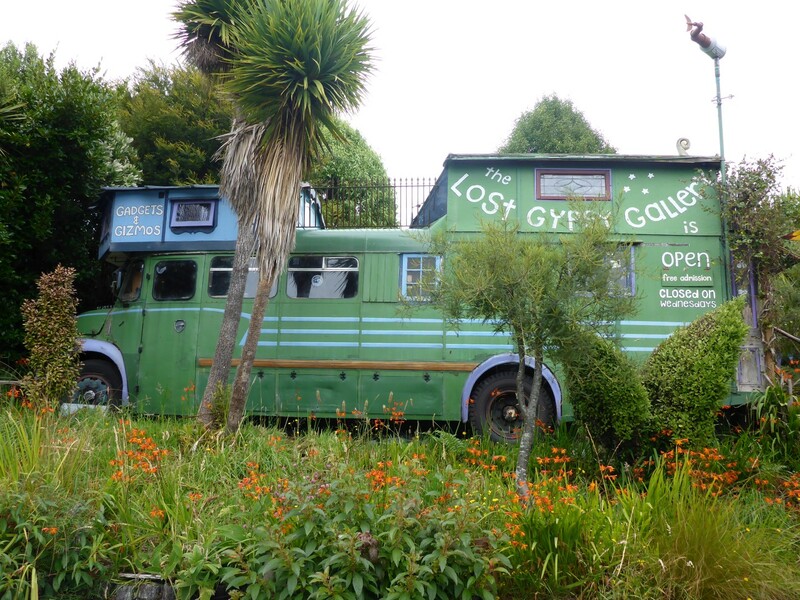 First port of call was the Lost Gypsy Theatre. What a fascinating place! It’s an old bus which has been converted into a display facility for the owner’s huge number of fun, funky and fabulous models. He makes them mostly out of stiff wire and the majority are worked just by turning a handle or pulling a wire. Sometimes they light up or make a noise as well. Their style reminds me of those old toys from Victorian times, that can be seen in museums, although many also remind me of toys from my childhood. There is a model railway that runs around the perimeter of the bus too. 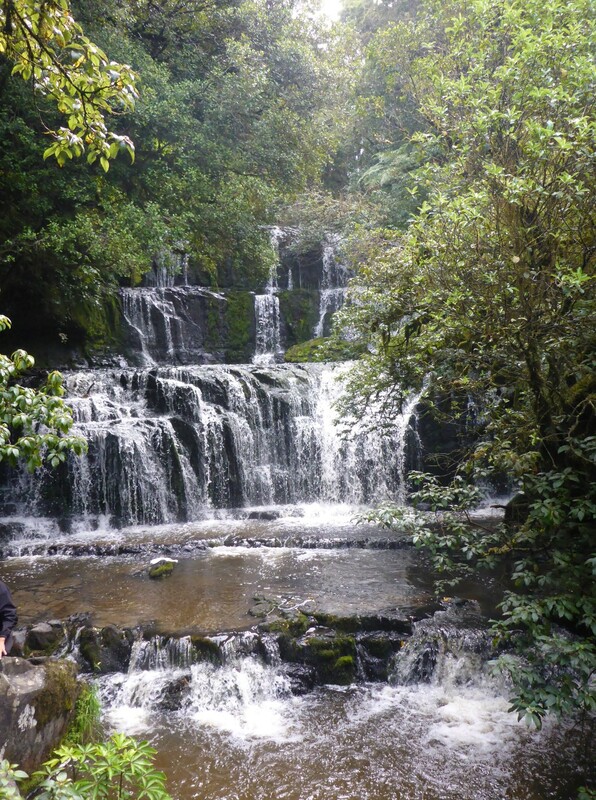 We went down to the sea shore, taking in a very pretty waterfall on the way. 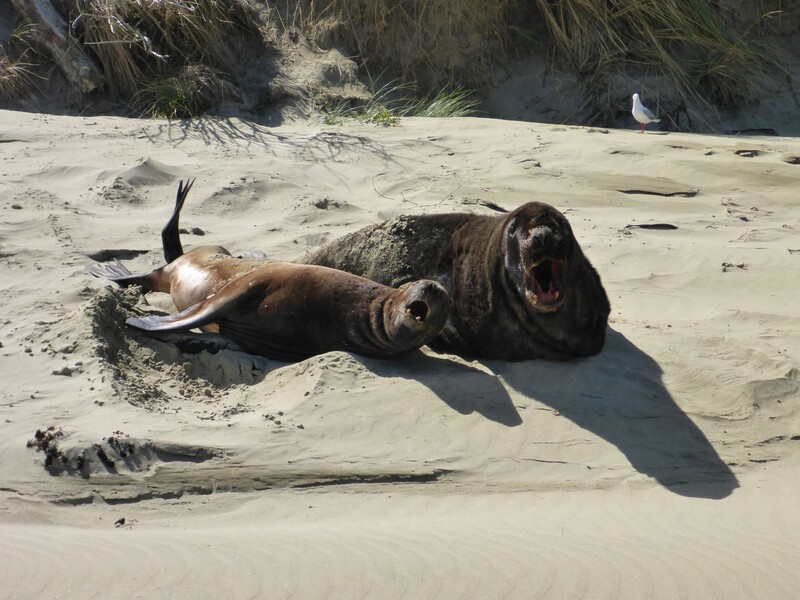 After a bit of a walk on the sand we came across some sea lions, basking in the sun. They come ashore at low tide and just loaf around on the beach, sleeping off their breakfast. They can attack if there’s cubs around and it’s best to keep a bit of distance as they can move faster than their bulk suggests. Sun basking Sea Lions. Do not disturb! 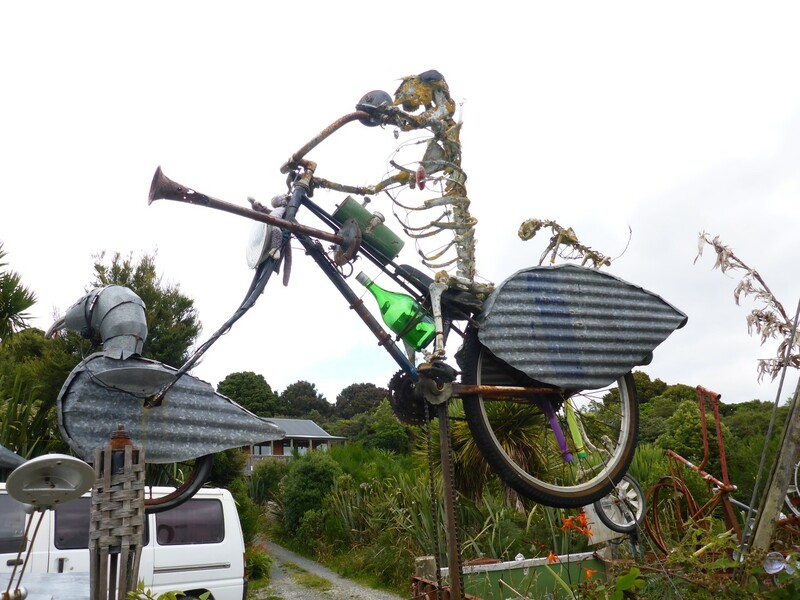 On the way back to the house we stopped to look at an old skow which had been bought by some Auckland Yuppies. They wanted to convert it into a floating restaurant. Despite being warned that the boat wasn’t seaworthy, they decided to sail it up the coast. It was taking on so much water that it only managed to cross the river before it had to be abandoned. And there it sits, a warning to all those who think they know better than the local experts. It’s a great shame because the hull contains three layers of Kauri wood which would be very valuable if it could be recycled. Abandoned by the ignorant owners. Brian rides a Honda CX400, imported from Japan. He also has an old MZ, which he is refurbishing as a local run around. He used to be a teacher, and still worked sometimes, post retirement. But he said he fell out of favour with the authorities because he used to teach the kids things they needed to know, such as life skills, instead of what he saw as a fairly pointless curriculum. So now, amongst other things, he helps Jill tend their very fabulous garden. We had some very enjoyable chats about bikes, racing, and Australia. Brian had visited and worked there so he gave me some useful pointers for my future visit. Once we’d finished putting the world to rights and had finished lunch, I headed off for a very nice ride along the coast on the way back to Dunedin. In and out of small, pretty bays, wandering along the gravel trails. The weather wasn’t great but it was good enough to enhance the pretty countryside and the great sea views. A couple of times I came across big herds of cattle or flocks of sheep, being moved via the back trails, reminding me that almost every area of NZ that is accessible is busy producing food of some kind. Dramatic coastline along the Catlins. Back at Maureen’s I made plans for the next couple of days. Birds were on the agenda, feathered of course. 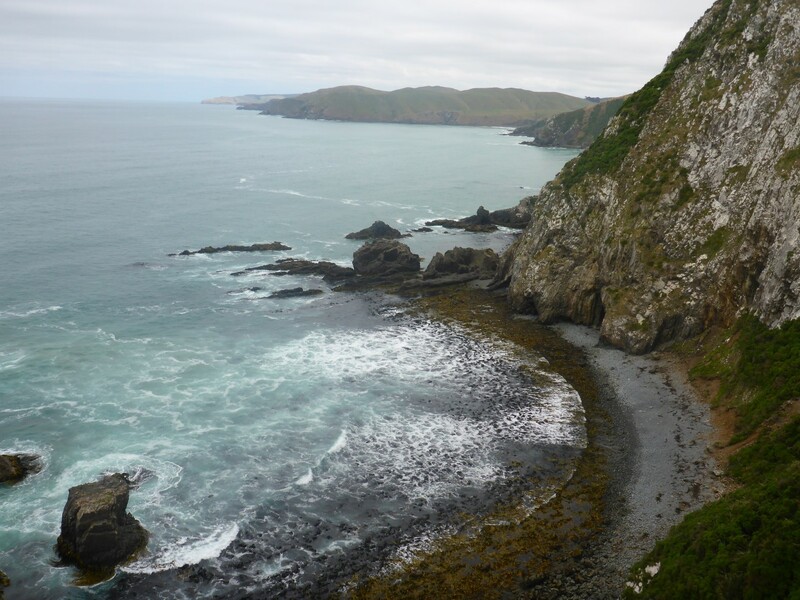 I made plans to visit the Royal Albatross Colony and Penguin Place, both of them out on the Otago Peninsular. They are nature reserves and sanctuaries for each type of bird and help to protect and enhance the population of species which might otherwise struggle to survive. They often have no real defence against animals which European settlers introduced, such as stoats, weasels, rats and feral cats. Possums were introduced for their fur and have also become a major pest. Efforts are continually under way to combat these creatures and these sanctuaries are part of the battle. 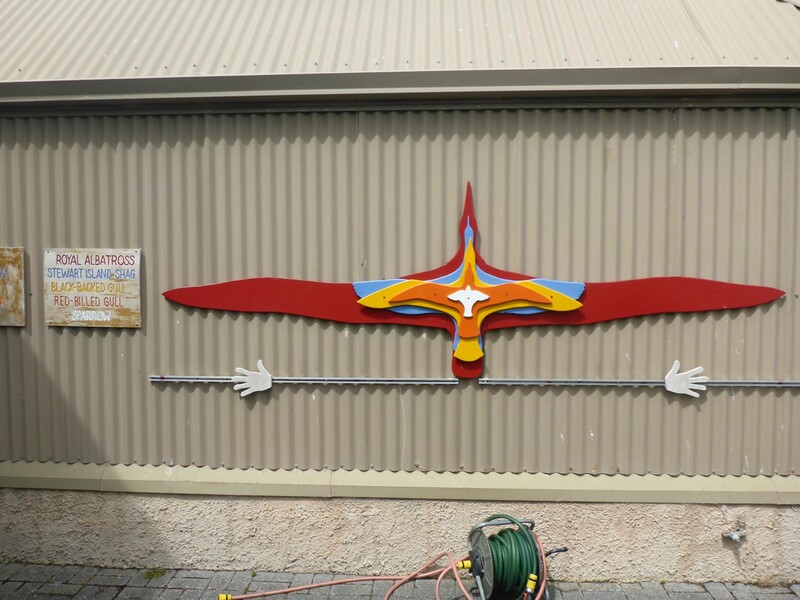 Albatross wingspan, compered to other birds. 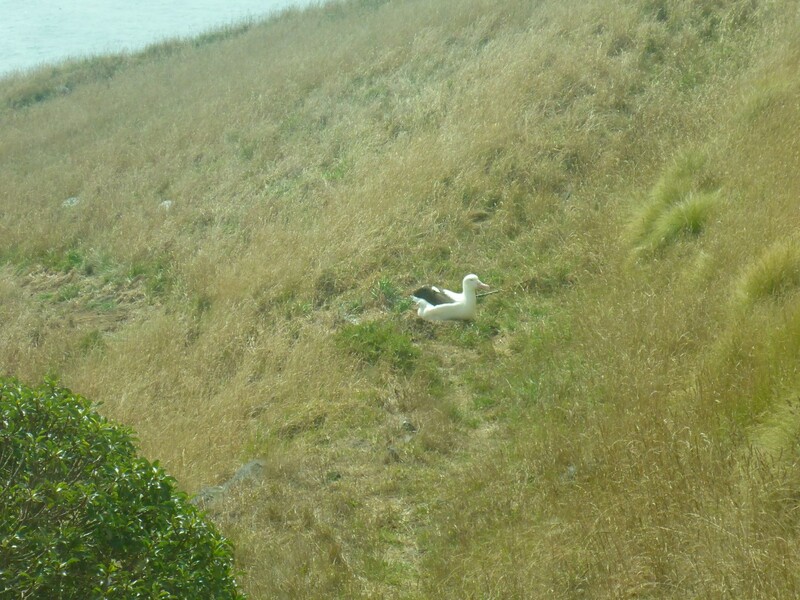 The Albatross colony is out at Taiaroa Head and was established in the 1950’s. The area became a nesting site for these birds after it was cleared of its WW2 fortifications. Ironically it was the clearing of the brush and trees for military purposes, originally carried out in the late 19th C, which made it a suitable nesting site. Protected from predators, the site has developed into an area of continuous monitoring and study of the birds. Peeking out from behind the Albatross is a chick. A few Albatrossy Facts. They have a wingspan of up to three metres, making them the worlds largest bird. An adult weighs about nine kgs. Chicks take their first flight at about seven months old and then don’t touch land again for over a year. The parents will leave the colony for a year before returning to breed again. Meanwhile their chicks will only return to the colony after four to five years. Our guide, Joel, told us that the juveniles – birds that are not quite old enough to breed – will practice their mating dances and nest building skills before ‘trying it on’ with a potential partner. They mate for life. 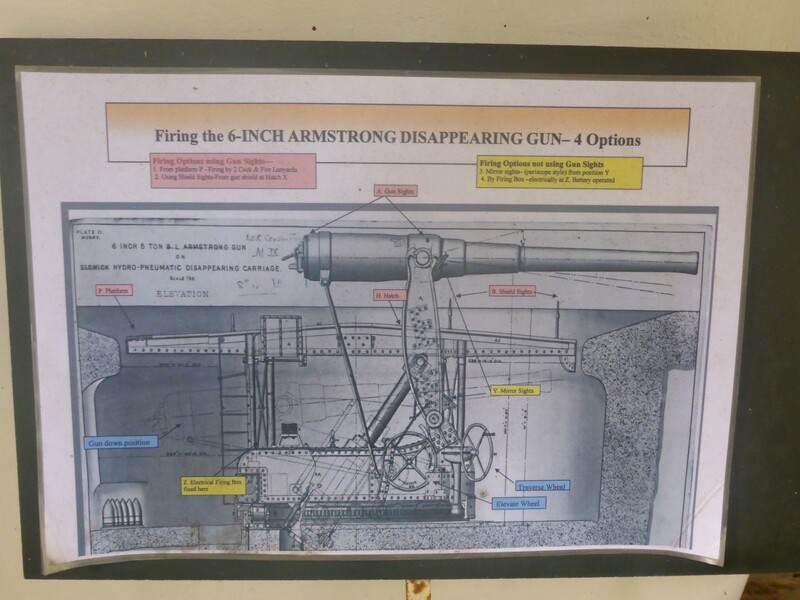 Joel also took me to see the Armstrong Disappearing Gun. 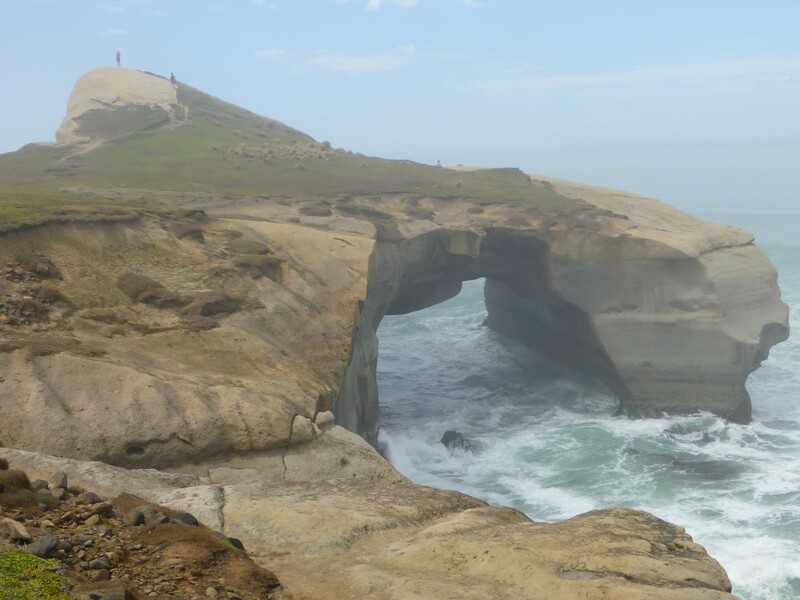 The headland has served as a defensive position since the first human habitation and the European settlers were quick to follow their Maori predecessors. In the 1880’s war was threatening between Britain and Russia. Fort Taiaroa was constructed and in 1889 this innovative artillery piece was installed. Built by Armstrong of Newcastle, it is a six inch, breech loading gun on a hydro-pneumatic carriage. It is sited in an underground circular pit and it was aimed and loaded while still underground. 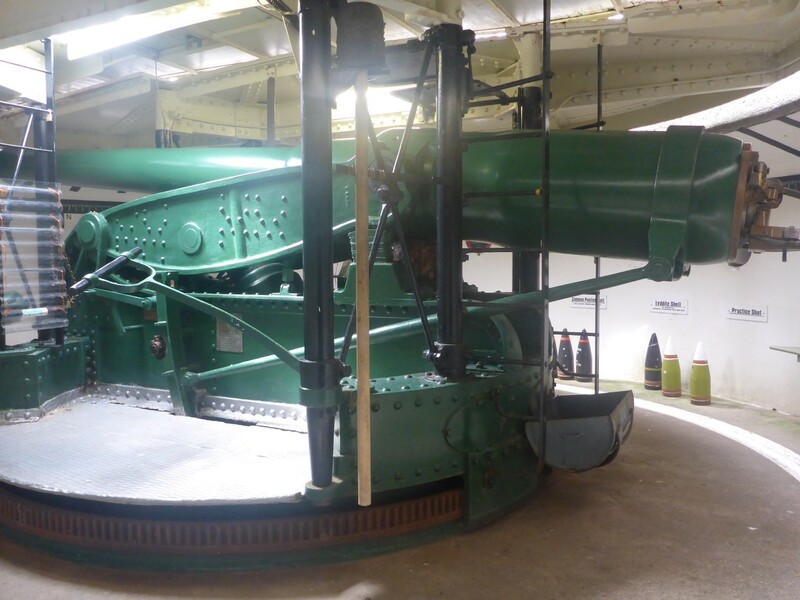 A water and air ram system then raised the gun above ground for firing and the energy from the recoil was harnessed to force it back underground for reloading, at the same time recharging the hydraulic pressure. It was never used in anger and had been overtaken by better technology by the time of WW1. Fortunately it was preserved, along with all its workings, and proved to be fascinating.When I got back to Maureen’s I realised I’d managed to leave my backpack behind, just for a change, but was very glad to receive an email later to say it had been found. 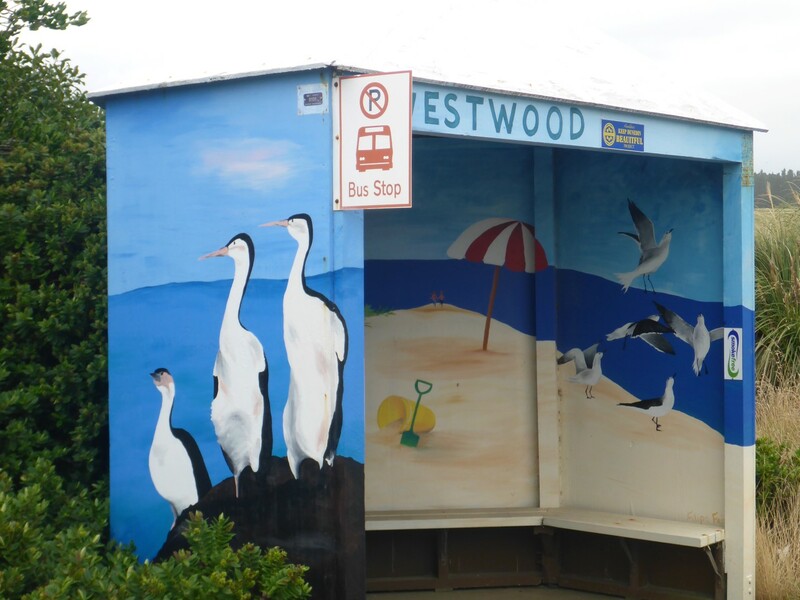 Artistic bus shelter, Otago Peninsular style. Next day I visited Penguin Place, one of two penguin reserves on the peninsular, this one dedicated to the Yellow Eyed Penguin. These are another endangered species and this privately run reserve helps to maintain breeding birds and rescues those injured or abandoned. This was another fascinating visit and we were able to get much closer to the birds than had been possible at the Albatross centre. There is a hospital and a large nesting area there, in amongst the brush. 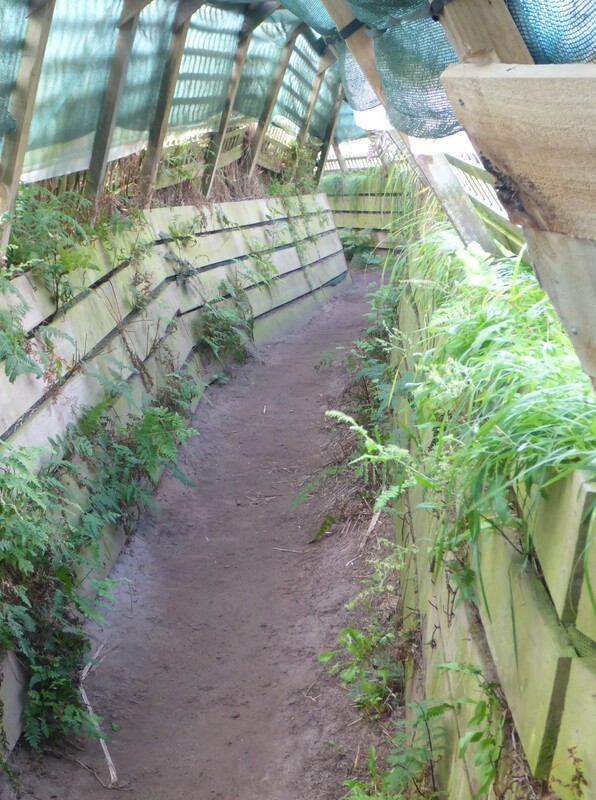 The owners, who are keen conservationists and started the centre almost as a hobby, have dug out trenches which enable visitors to walk along, effectively at ground level. Below ground trench, visitors for the use of. We were warned to be quiet and the reward was to be able to see the chicks at about a metre distance, close enough to see the yellows of their eyes! 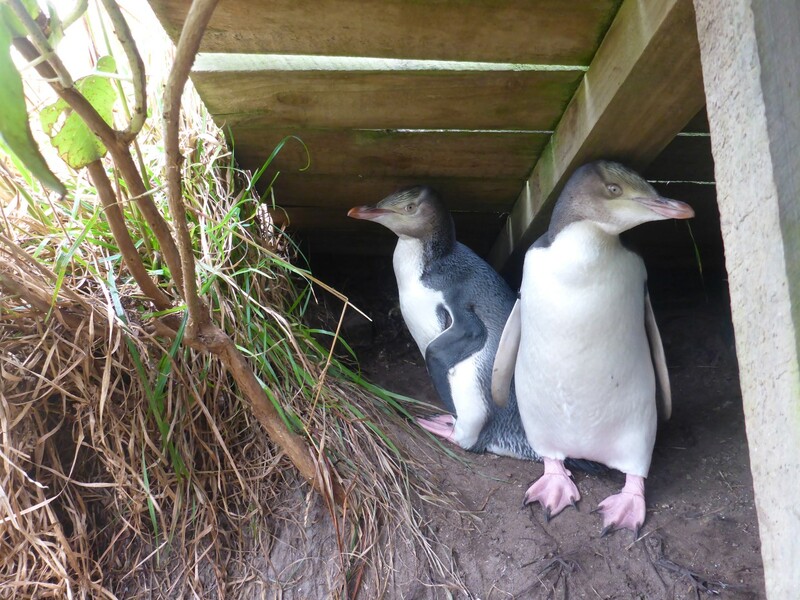 The reserve has set up nesting boxes amongst the brush, favoured terrain for the penguin, and they have been very successful. The adults leave the chicks on their own during the day while they go off fishing, travelling up to fifteen kilometres out to sea and twenty five along the coast to find food. At dusk they return and feed them. Cute chicks, patiently waiting for their fish dinner. 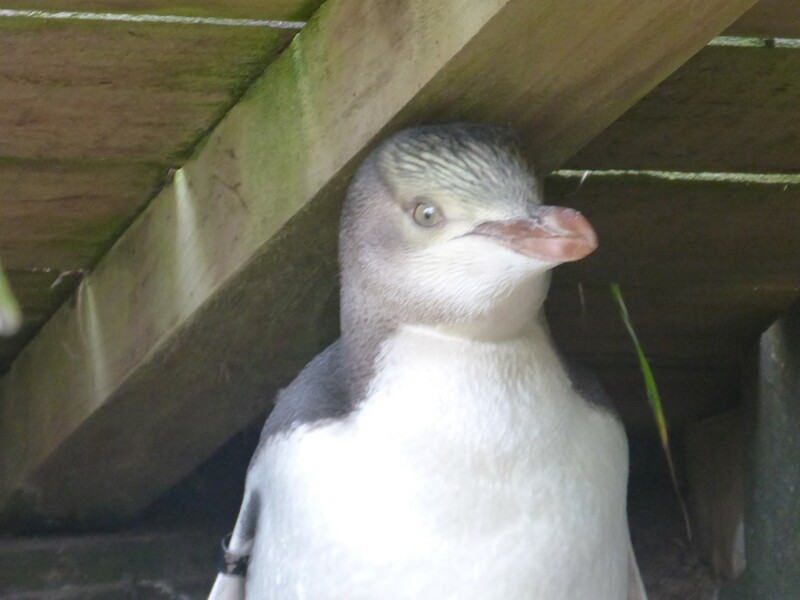 It is during the day that chicks can fall prey to predators, all of whom have been introduced to NZ by settlers. Reserves such as these invest time and effort in keeping their areas predator free. The chicks looked cute of course, and it was great to see that the work of the reserve was ‘breeding’ success. 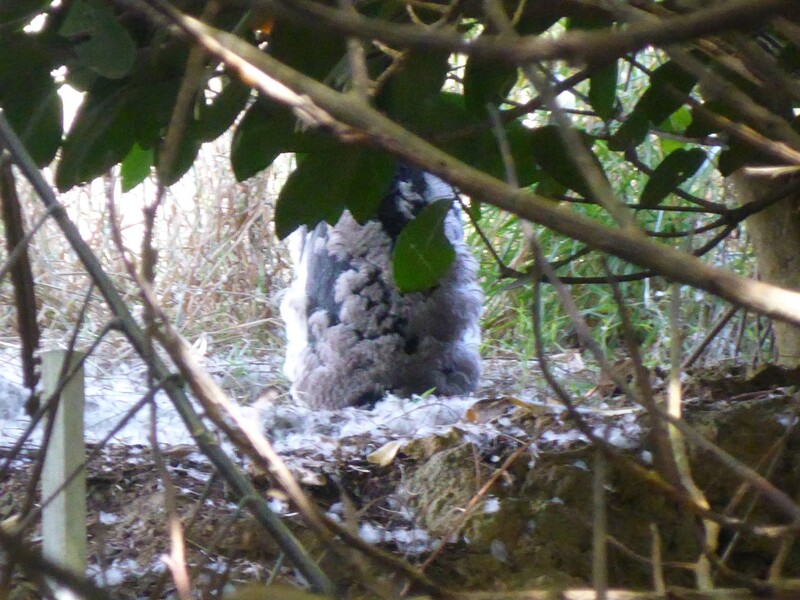 I also saw an adult who was in the process of its annual moulting, which takes four weeks. During that time they can’t go in the water, so no food. In the wild the weaker ones die. They have a gland at the base of their spine which emits an oil. Once the new feathers have grown they use this oil to preen them, so making them waterproof. This is a constant task. Any adults which aren’t heavy enough to survive the annual moult will be hospitalised at the reserve, thereby helping to increase numbers. They mate for life but if chicks fail to arrive they will split up, by mutual consent, and find new partners. So it’s not just humans then. After leaving there I went back to the albatross centre to collect my bag only to discover they didn’t have a clue as to what I was talking about. No-one there had sent me an email. So, back at Maureen’s I re-read the email and realised it was from a German lad who had seen it fall off my bike and had stopped to pick it up. I met him and his friend that evening and they told me they’d got my email address from the Inter Islander ferry ticket that I’d, luckily, left in there. Another backpack related close shave. Maybe I’ll learn to be more careful? Maybe. 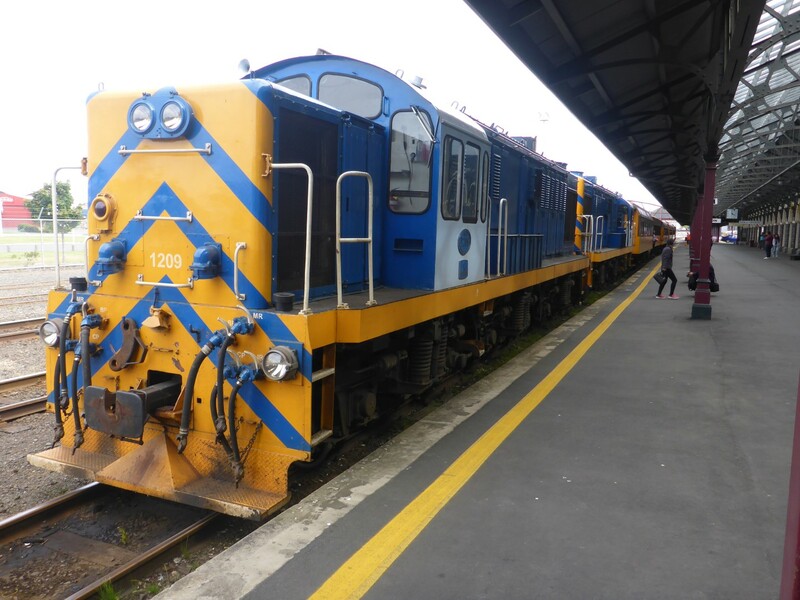 This train takes tourists out on the mountain railway from Dunedin. 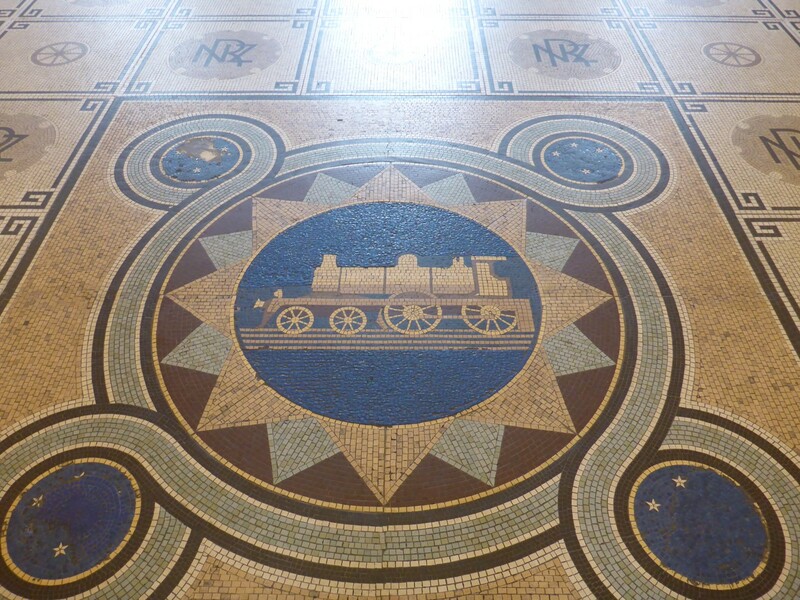 The beautifully restored Dunedin station concourse. As it always does, the time came to move on. I’d had a great time at Maureen’s. We have much in common, especially as travellers, and it was great to meet her friends and just spend some time relaxing and socialising. One of the delights of travelling is to enjoy chance meetings with people and Maureen’s generosity was especially delightful. I know I want to go back to NZ in the future so I’m sure we’ll be able to meet again. Cheers Paul. It would be well worth a visit but you need to be there for a fair while to get the benefit. I’d suggest two months at least. A brilliant read, thanks Geoff. Happy days. Keep safe. Yes, I’m lucky that I’ve had so long to explore but even so, I felt I could have used more time. I’d like to go back too some day.